Japan's Yukio Kagayama won both races of the World Superbike Championship round in the Czech Republic as series leader Troy Bayliss saw his hopes hit. Kagayama took both race victories at Brno for Corona Alstare Suzuki as Bayliss crashed out of race one and finished eighth in the second race. The Australian still holds a commanding lead in the championship points. 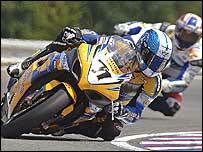 Britain's James Toseland was second in race one on the Winston Ten Kate Honda and fifth in race two. He is now battling with Japan's Noriyuki Haga and Australian Troy Corser for second in the championship standings. And after crashing on Saturday just before Superpole and then colliding with another rider during Sunday's warm-up, Toseland was pleased with his performance. "I'm happy the way things worked out - but we could have taken advantage of Bayliss having a bad weekend a bit more than we did," he said. "But we'll keep chipping away." "It was good to get a podium in race one but there was nothing I could do when Kagayama went past me. "The little bit higher temperature in the second race made the difference, and I made a couple of silly mistakes." Haga backed up fourth in race one with third in race two and now has 189 points to Bayliss' 262, with Toseland third on 188 and Corser fourth on 173. Kagayama won the first race from Toseland and fast-finishing Italian Michel Fabrizio on the DF Xtreme Honda. Bayliss had gone out of the race in the first corner when he was forced wide and Regis Laconi, on the PSG-1 Kawasaki, went for the gap the Australian left. However, Bayliss tried to cut back in and collided with Laconi and both riders were thrown from their machines. Haga took fourth on the Yamaha Italia machine ahead of Corser's Corona Alstare Suzuki, Spaniard Fonsi Nieto and British team-mate Chris Walker on the PSG-1 Kawasakis. Craig Jones had one of his best results of the season in 17th on the Foggy Petronas FP1. Kagayama took the second race as Bayliss, on his Ducati Xerox machine, saw his advantage in the title race further eroded. Fabrizio went one better in race two as he just held off Haga and Corser in a three-way battle for the runner-up spot. Toseland edged out Nieto for fifth as Walker came in 10th, Jones taking 21st.